I’m not Irish. I’m told I’m English and from an area that holds a particular grudge against the Irish. Mortal enemy or not, you Irish have a damn good holiday. I’m not even sure why we celebrate it and I don’t care. It’s comes around just as the days get longer and the ground starts to thaw. 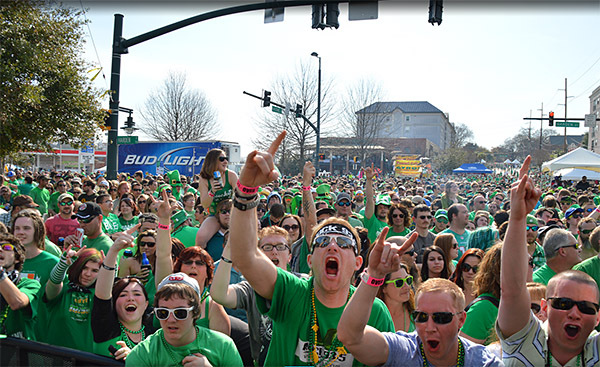 This year marks the 33rd annual St. Pat’s in 5 Points celebration and musically it may be the best yet. 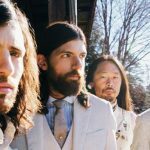 That’s high praise for a festival that’s hosted such acts as Arrested Development, Manchester Orchestra, Chevelle, Robert Earl Keen, and Ben Bridwell. This year Chris McLane with AEG Live has done a fantastic job of honing in on what Columbia wants to see. 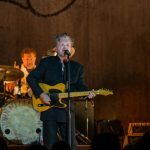 There is a clear and purposeful move to less of a radio-friendly lineup to one that features artists who seem to do their best work on the stage and not the studio. You can’t see it all, so in order to help you navigate the lineup I’ve provided a sample itinerary. Pick and choose if you like or don’t use it at all. It’s the gospel according to me and if you care about music then do you’re best to see these artists because they are worth it. Sunscreen. Use it. I also forget it and probably will this again this year, but do as I say, not as I do. Pace yourself. Don’t find yourself sick in a Port O’Potty (is that Irish?) at 4 in afternoon. Again do as I say…not as I do. Call a Cab. Checker Yellow is offering $10 cab rides to home or hotel. They will be lining up for you, all you have to do is get in and be coherent enough to give them a correct address. Be coherent enough to give them a correct address. It’s not just about surviving anymore, the festival has become a great deal more friendly to the average concert goer in recent years with the addition of more bathrooms, bars, mobile cell towers, and an increasingly strong lineup of artists. New for 2015 is The Cube, which is the St Pats version of the State Fair Rocket. It’s an enormous tower with the top 8 feet covered with important festival information such as band lineups. The bottom of the tower will be a public charging station for all types of mobile devices and will be staffed by the kind folks at T-Mobile. Also new this year there will be 2 C.O.Ws (Cell On Wheels) that will ensure everyone has sufficient reception for their cell phones (last year only one). While it is already sold out, the new VIP area is really awesome so I’m going to tell you about it so you know what you’re missing, and so you can be sure to jump on it early next year. The brand new VIP ticket gets you access to a private, catered viewing area in Saluda’s complete with open bar and clean restrooms. For $89 this entitles you to all the fun – none of the hassle. This year there were a record number of entries for the Battle of St. Pat’s with the winning band earning the right to a coveted spot on the Miller Lite/WCOS stage. After more than 30 entries and 6 finalists, local indie-rock act Tweito will perform at 12:30. Congratulations to those guys and hope that this is the start of big things for them in the coming year. 12:30 – First stop is the Bud Light Stage to check out the hardest working man in local music Dave Britt with his musically gifted rhythm section consisting of Steve Sancho on drums and James Beresford on bass. After catching a handful of tunes you should still have a chance to run by the 92.1 The Palm stage and catch the last half of Volcanoes in the Kitchen. These guys have some infectious energy and a great festival atmosphere about them. Great pick for this years lineup. 1:40 – Head back to the Bud Light Stage. In fact, get there early and get a good spot. Jessica Hernandez and the Deltas have the potential to be the secret smash set of the festival this year. It’s thick organ, heavy guitar and a trombone. Think of Black Keys with a female vocalist possessing tons of Detroit attitude. Don’t miss these one. 3:00 – An argument can be made that you should check out Stop Light Observations at this point (2:40 actually) and I wouldn’t fault you if you do. However, since you can likely catch the 6-piece Charleston group in the area very soon, I recommend you hang out at the Bud Light stage and take in Moon Taxi. Out of the Nashville rock scene, Moon Taxi has a softer, more polished edge to their sound. They have a broad appeal but are still interesting enough to keep the discerning ears tuned in. 4:00 – It’s time for a change of pace. Make your way to the Miller Lite Stage and check out Holly Williams. When your grandfather is Hank Williams and your dad is none other than Bocephus, there is a tendency for listeners to either create unrealistic expectations or dismiss them as a silver spoon recipient. That is not the case here. Holly Williams has quickly garnered attention from those who know music because she is the real deal. If you like John Prine, Emmylou Harris, or Bonnie Raitt go see Holly Williams. 5:45 – This is a tough call – Chris Robinson Brotherhood vs. J. Roddy Walston & The Business. CRB has some talented guys like Neal Casal on guitar (Ryan Adams & The Cardinals, Hard Working Americans), former Black Crowes keyboardist Adam MacDougall, and of course Chris Robinson of Black Crowes fame. However, J. Roddy is a damn fine band and puts on one helluva a live show. I’m going to go with the CRB here only because friends in Charleston saw them at the Pourhouse and said they absolutely killed it. If you choose to take in J. Roddy you will not be disappointed and I may make a last minute call to head your way. Either way, you’re set up for great closer to one of the finest lineups in St Patrick’s Day history.